You have 1985 characters. Don’t forget to add important and relevant keywords in your description to improve your iTunes app page and optimize your SEO. Your app's last version was released on December 06, 2017. It is important to regularly update your app. Best practices recommend to update your app every 4 to 6 weeks. This means fixing reported bugs, improving existing features, launching new features etc. Keep an eye on users' feedback. The next great features may already be asked by many users. View and manage your documents stored in Dropbox, Box, OneDrive or Google Drive. Support for multiple accounts. Perform common file-management tasks, such as copy, move, delete, upload etc. Download from the web directly to the cloud. High quality viewers, including excellent support for PDF, Office, iWork & images. 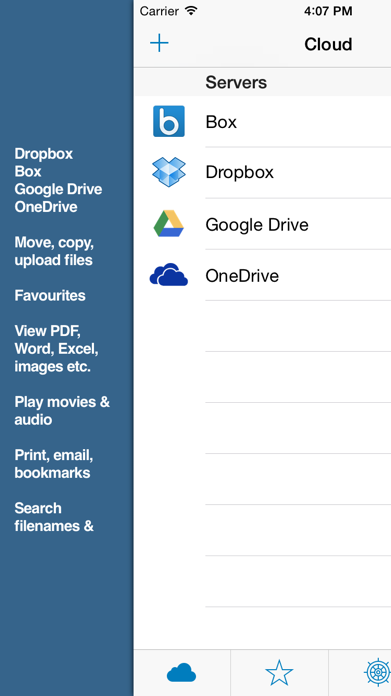 Cloud Files gives you full access to your documents stored in Dropbox, Box, OneDrive or Google Drive. You can connect multiple accounts for each service. Secure the app with a standard 4-digit passcode. - Perform common file-management tasks, including copy, move, delete, upload and other standard actions. - Copy or move documents between cloud services. 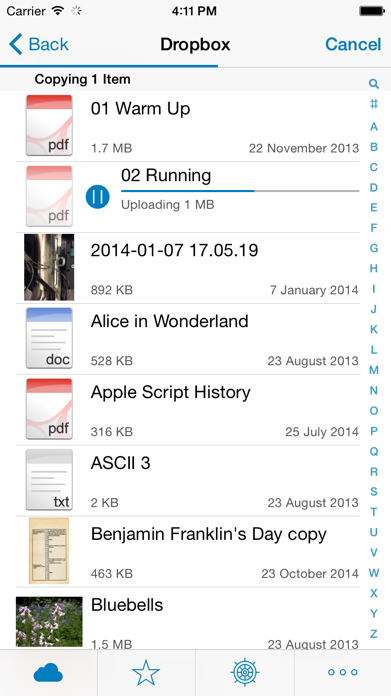 - Upload images or movies stored in your Camera Roll. Download files from the internet and have them uploaded automatically to the cloud. - View most common file types, including Microsoft Office documents, PDF documents, image, movie and audio files. - Add bookmarks for easy access to often viewed sections. 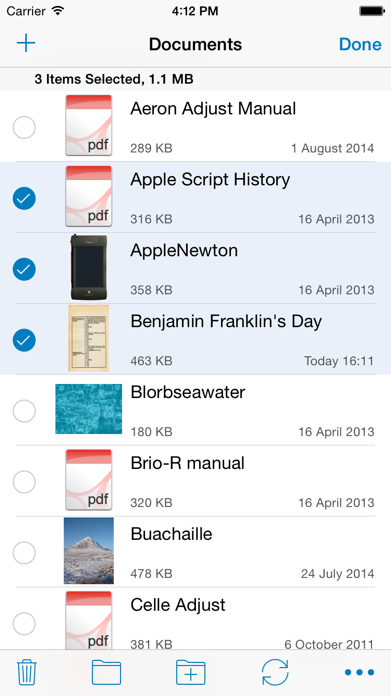 Cloud Files' PDF reader handles large documents with ease, including vertical and horizontal page layouts. 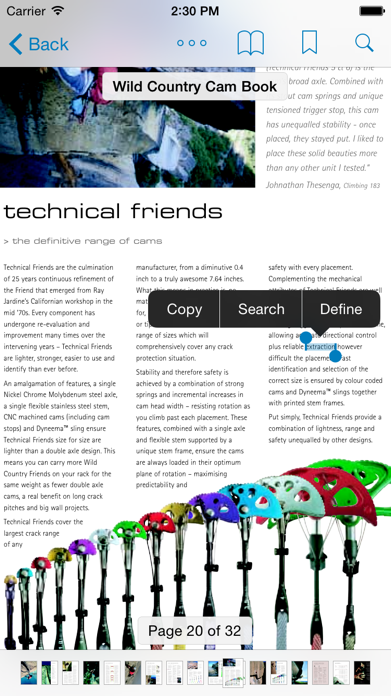 - Search the full text of PDF documents. - Double-tap to zoom into text regions or images. - Password protected PDFs are supported. Fast, high-quality image viewer, with support for zoom and pan, slideshows and thumbnails. You can also export photos and movies to the Photos app. - Stream audio from the cloud. - Play single files, or an entire folder of music in Cloud Files' own audio player. - Artwork and other metadata are supported. With Cloud Files all your documents are at your finger-tips. - Most Microsoft Office documents are viewable. - PDF, RTF, HTML, Apple iWork and text documents. - Image, movie and audio file support is limited to those formats supported by iOS.